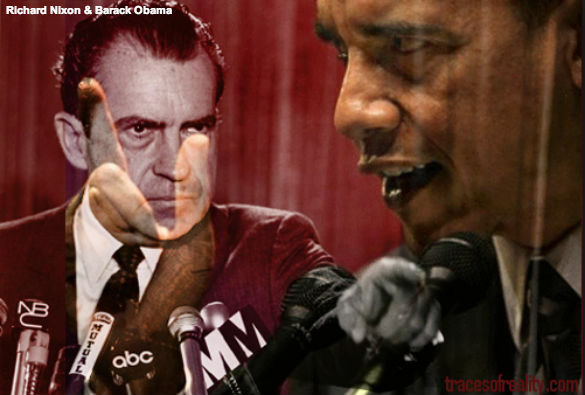 For the most lawless presidency in American history the liberal “journalists” of the establishment media generally look to the Nixon administration and the Watergate break-in and cover-up. But those examples of Nixon’s law breaking were small potatoes compared to Barack Obama’s policy of systematically breaking and ignoring the law in pursuit of his radical leftwing agenda. As opinion-leading commentator Charles Krathammer told Fox News’ Bret Baier: “This is stuff that you do in a banana republic. It's as if the law is simply a blackboard on which Obama writes any number he wants, any delay he wants and any provision. By Krathammer’s count Obama has altered Obamacare twenty-seven times since it was passed. And that’s just one law – that doesn’t count the number of times he’s altered or ignored the provisions of immigration laws Congress passed or the Hyde Amendment prohibiting the federal funding of abortion on demand. Texas Congressman Pete Olsen’s bill to impeach Attorney General Eric Holder, Obama’s chief accomplice in his law breaking, has just twenty-three co-sponsors and has never been scheduled for a hearing. Members of Congress who have suggested that Obama has committed impeachable offenses, such as Texas Congressman and Senate candidate Steve Stockman, have been quickly batted down and silenced by the House GOP “leadership” who want no part of a fight over Obama’s policy of lawlessness. Three things: first, Nixon’s law breaking was more of an artifact of his peculiar personality, not a well-thought-out plan to circumvent Congress to accomplish his policy goals; second, there’s no “impeachment lobby” at work to investigate and demand public attention and action on Obama’s law breaking, as there was with Nixon’s Watergate cover-up. Third and last; there’s no leadership in Congress willing to use the means and tools the Constitution provides to actually hold a President accountable for violating the law, and that being the case Obama is right, as a President, with a spineless Congress prostrate at his feet, unlike Nixon, he can indeed do anything he wants. Submitted by rosugill on Tue, 02/11/2014 - 15:15. From what I could tell, Nixon was not a bad president over all. The Watergate thing was handled poorly, but that was just dirty politics, and both parties are guilty. The bozo that is in the White House now is trying his best to destroy our country any way he can, and our spineless Congress and the Supreme Court, which are supposed to be checks and balances, are utterly failing at doing their jobs. There are far to many connieonazicrats, aka liberals, in the Government form the Congress on down, and they should be purged from the Government. I sincerely hope there will be a sharp right turn in November, and that the next Congress will challenge this nitwit in the White House on every questionable thing he does. That is what the Congress is supposed to do.